We live in one of the most exciting times in the history of books. Not only are books that can change people’s lives easier to write and publish, but distribution and marketing of these books is easier as well. This means that more books are actually landing in the hands of the people who really need them. For those who know me, I have lived happily in the book world for more decades than I care to admit, and I have seen many people come and go throughout the years. I have had the honor of working with some great iconic authors. With my love for marketing books, I continue to inspire many other authors to pursue their bigger and better visions. I am so happy to know Stella Togo and to have worked with some of her clients. The Million Dollar Seed is a breath of fresh air. 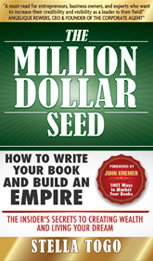 Anyone who dreams of writing a book and making lots of money with it needs to own The Million Dollar Seed. Stella’s mega-accelerated approach to writing and marketing bulldozes through old paradigms and focuses on innovative systems that work! The Million Dollar Seed immediately catapults you into a whole new mindset that works—a mindset that shows you how to become a successful authorpreneur in less than a year, so you can create wealth and live your dream now.